'Anti-social behaviour' has become a label attached to a huge range of nuisance and petty crime, and rarely out of the headlines as tackling this problem has become a central part of the British government's crime control policy. At the same time 'anti-social behaviour' has provided the lever for control mechanisms ranging from the draconian to the merely bureaucratic, most notably in the shape of the Anti-Social Behaviour Order, or ASBO. 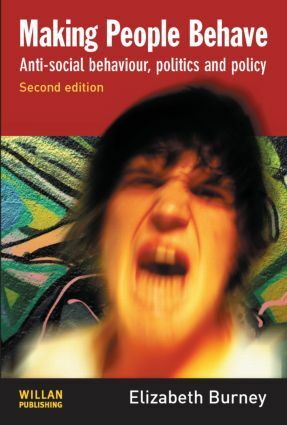 This book seeks to explain why anti-social behaviour, as a focus of political rhetoric, legislative activity and social action, has gained such a high profile in Britain in recent years, and it provides a critical examination of current policies of enforcement and exclusion. It examines both the political roots of the variety of new measures which have been introduced and also the deeper social explanations for the unease expressed about anti-social behaviour more generally. This updated new edition of Making People Behave takes full account of recent legal and policy changes, including the 'Respect' agenda, as well as relevant research on the subject. It also contains two wholly new chapters, one of them devoted to the expanding web of behaviour controls, the other on Scotland which provides an alternative to the enforcement-oriented approach evident in England and Wales – complementing the wider coverage in the book of developments in North America and Europe. 7 How different is Scotland?